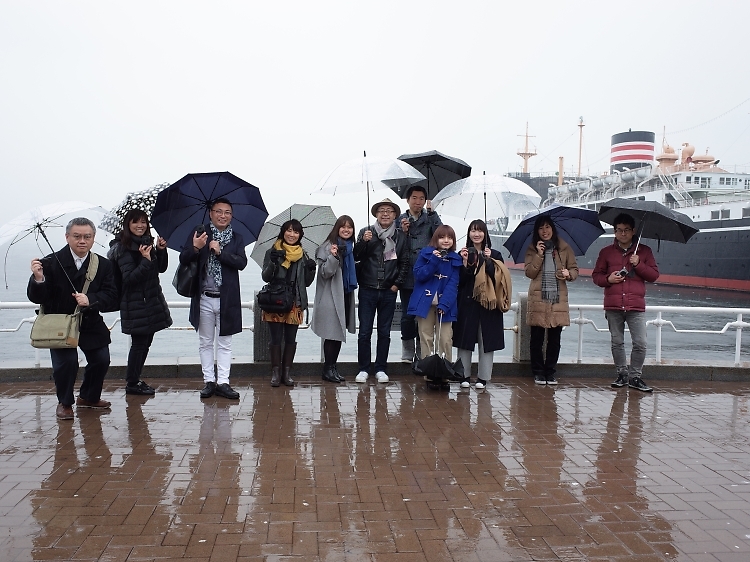 The 5th GR trip was held in Minatomirai, Yokohama on February 28- the first day of CP+. To our surprise, the group consisted of instructors and staff from PhatPHOTO photo school. 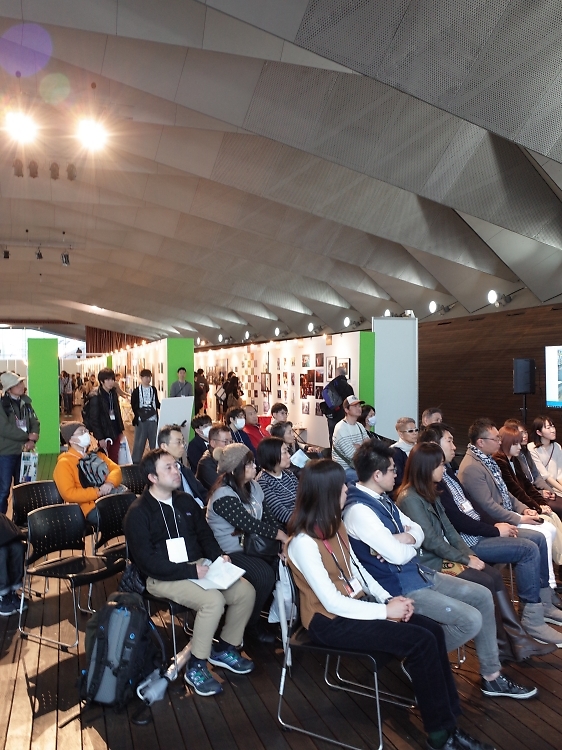 In addition, the review was open to public on the stage of Onaeba- an annex venue of CP+. They applied because they hoped to learn something new by being students as opposed to what they normally do- teaching. But since the review was going to be open to the public, they had to perform well in front of their students. The special guest GRist for this special occasion was Alao Yokogi! As you know, he is the master of street photography. We were excited to hear what he had to say. Unfortunately it rained hard and was cold all day. It was as cold as in winter. 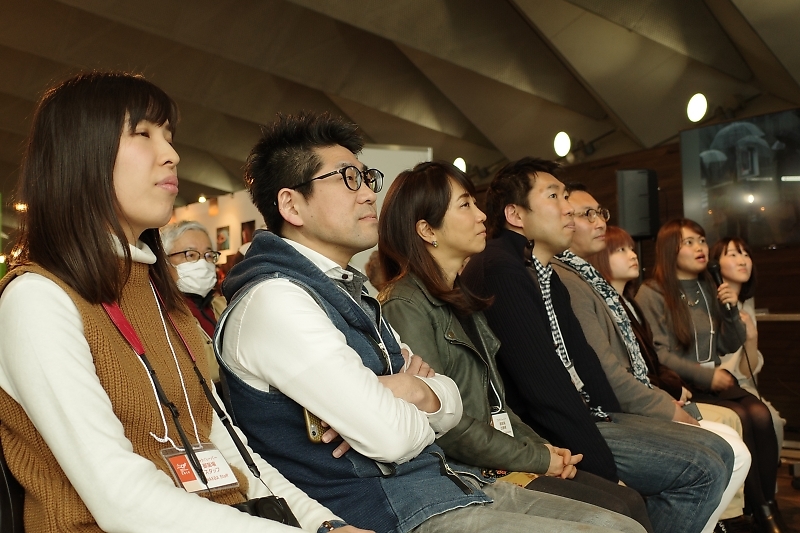 We began with the orientation at one of Onaeba annex venues- Osanbashi Hall. In the weather not necessarily good for shootout, they were all wrapped up and started walking. 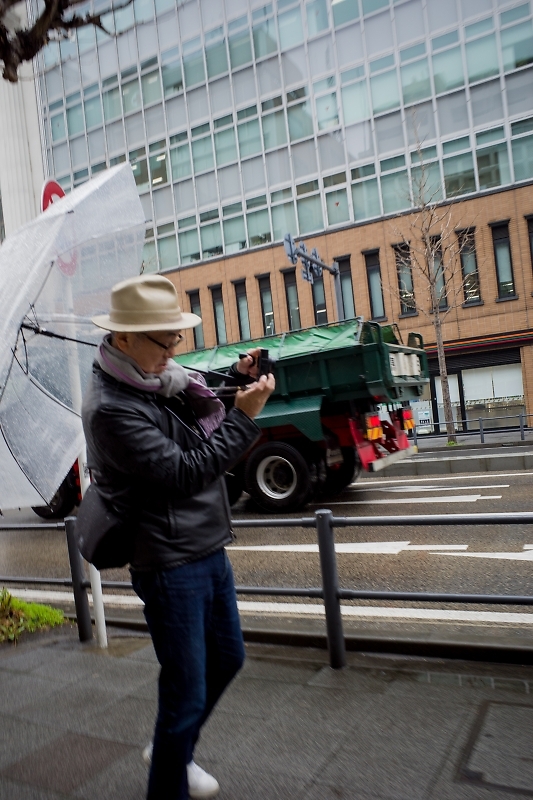 Snap shooting Mr. Yokogi snap shooting the street. They did not mind getting wet and were absorbed in photographing. 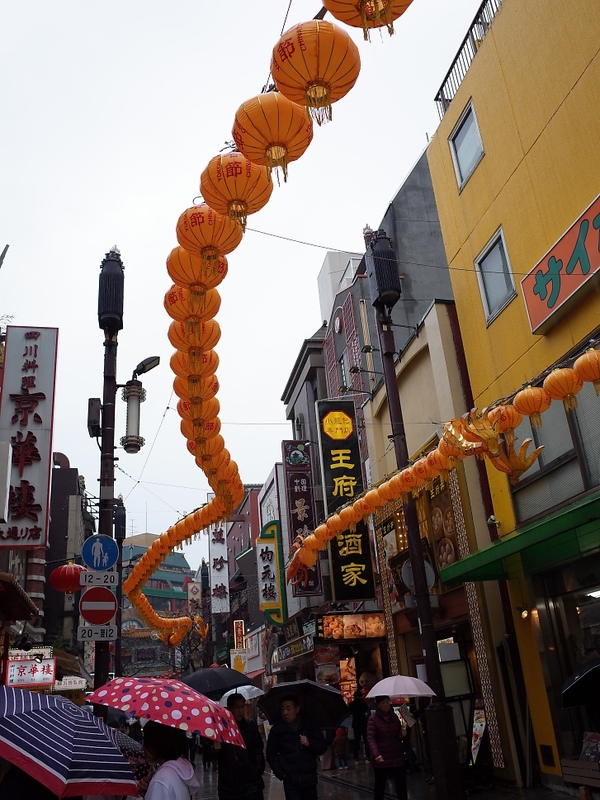 Chinatown was crowded even in the rain. Having a break to warm up the cold body with a steamed bun. There were not many people in Yamashita Park. They were seeking their subjects from their own perspectives. "Look. I got something cool"
They all get along very well. They walked about 2 hours- from Osanbashi, Chinatown, Yamashita Park and back to Osanbashi Hall again. 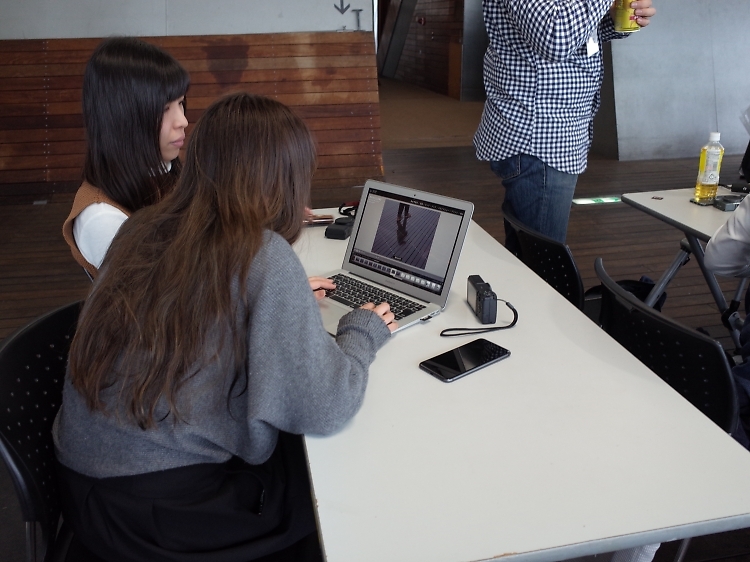 Concentrating on selecting photos for the public review. And the public review started. Lots of audience in the event space! The tension rises. After watching the GR concept movie, which had been partly revised as the release of GR III, the review started. Listening to the review seriously. 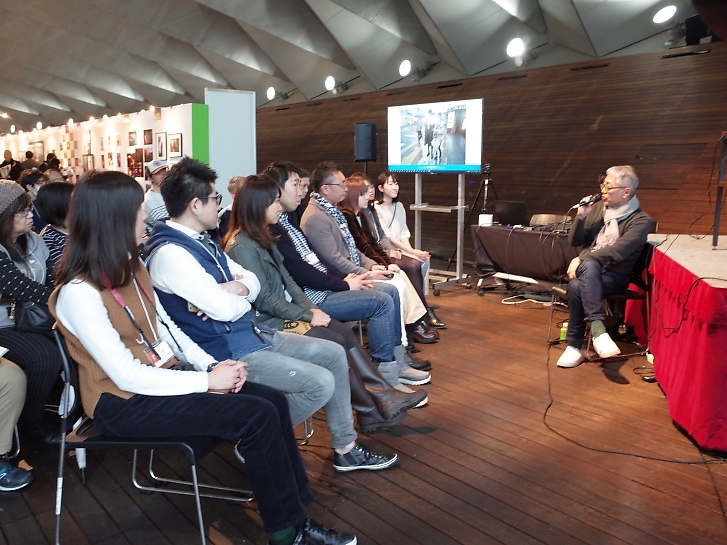 Mr. Yokogi said, in such a difficult condition for shootout, it would be amazing if you took even one good picture in a short time of 2 hours. In his comments, he repeatedly said that it was important to "take photographs simply and naturally." Since everyone is involved in photography as their day job, they were able to display their styles based on their personality in their photographs. Some of them had decided, prior to the event, on formats, colors of subjects and so on. Because they have techniques, they could easily do too much in their photo making. He highly praised ones that looked natural without too much manipulation. "It is boring if the intention is more visible than the photo itself." “In taking snaps, if there is anything that catches your heart, take it immediately. That will be ‘your picture’.” That’s one of his remarks that touched my heart most. You can see the photos by the GR trip participants here. Take a look at their unique work. 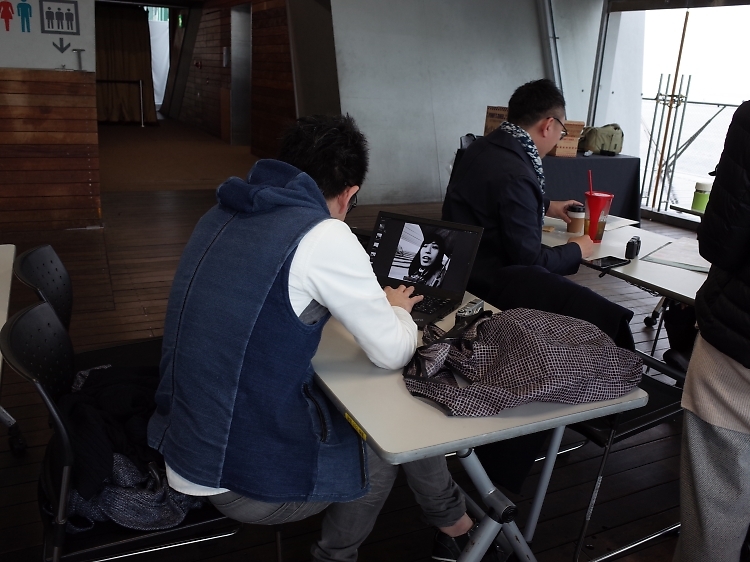 After commenting on everyone's photos, Mr. Yokogi shared 5 pieces of his. He took 600 photos in 2 hours! 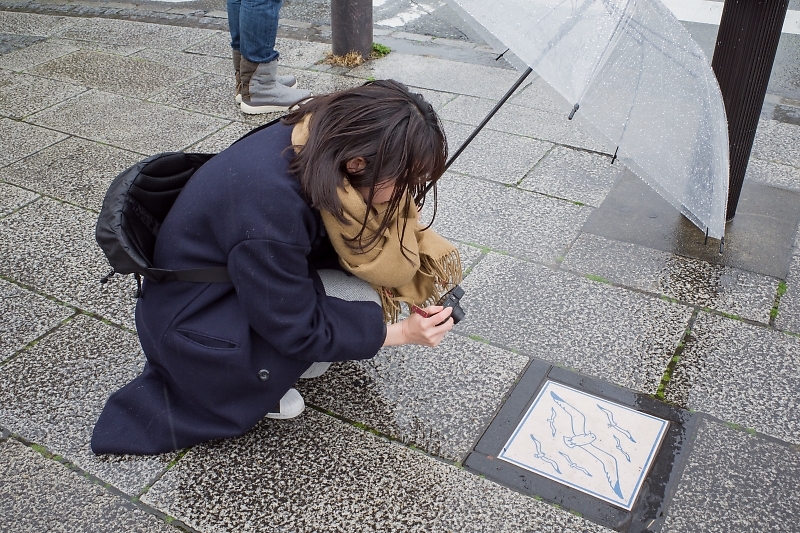 He usually shoot in continuous mode, because snapshots are captured by "lines" not by "points." He said about 3 to 4 frames per second was appropriate for that. And he showed us his photo of the day- a picture of the empty ocean by Yamashita Park. Enjoy Mr. Yokogi's works here. 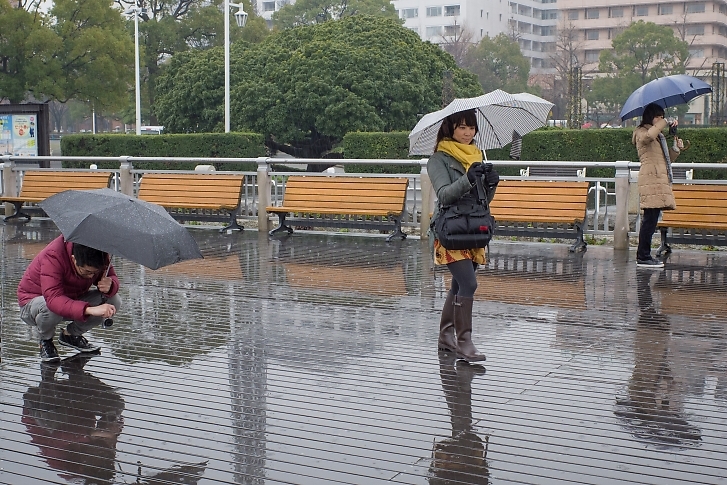 Usual group photo in the rainy Yamashita Park. The GRs of all the participants, as usual! Each one is very unique. 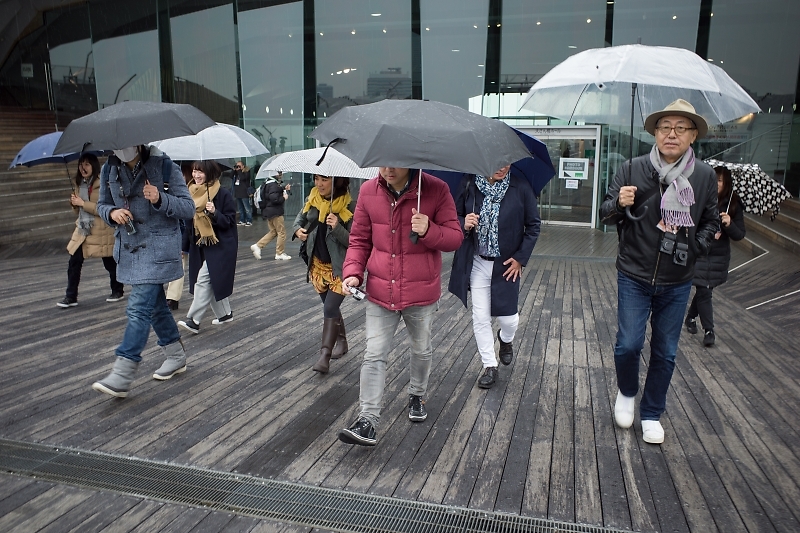 Thank you Mr. Yokogi and the participants for participating in the bad weather! I learned a lot by accompanying. I would like to take a lot of photos and find my own images. 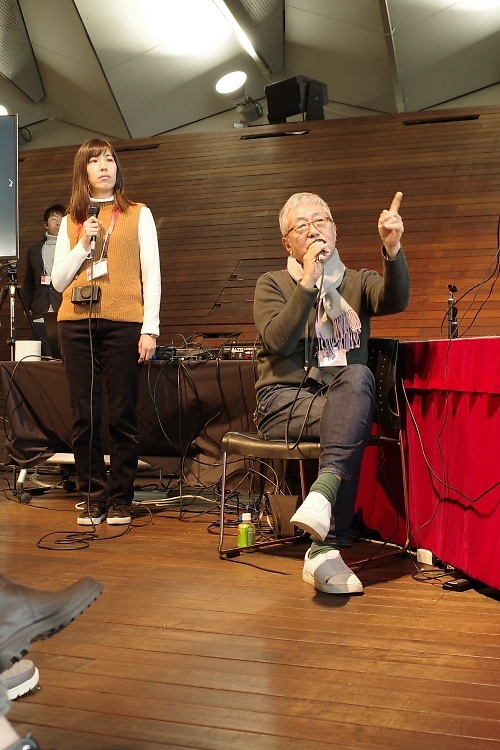 Finally, let me share with you some words from Mr. Yokogi and the organizer. Great rain. Yokohama looks nice when foggy. 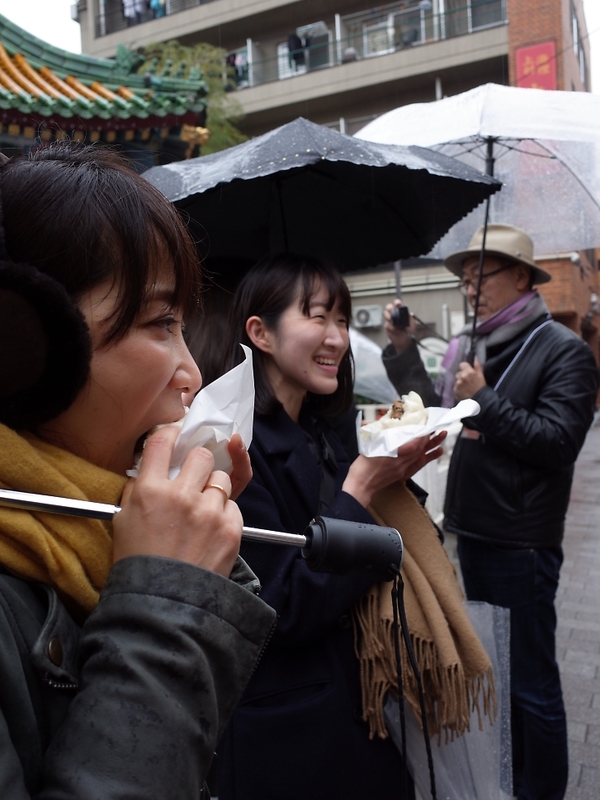 It was so cold that it could have been the best day to shoot with a drunken eye drinking hot sake. Instead, buildings and Chinatown. This time it was with PHaT Photo teachers and I was told not only to review their work but to show my work as well. Snap shooting is a routine shooting in a relaxed manner. I was going to encounter a great moment once- about 100m ahead, there was a woman running the sidewalk at full speed towards me. I was going to shoot at the moment she passed by. But she suddenly slowed down and turned to the roadway. I was out of time about 20 seconds. Oh well. That’s what it takes to snap shoot. I attended GR trip with instructors at PHaT PHOTO photography school and its administration staff. 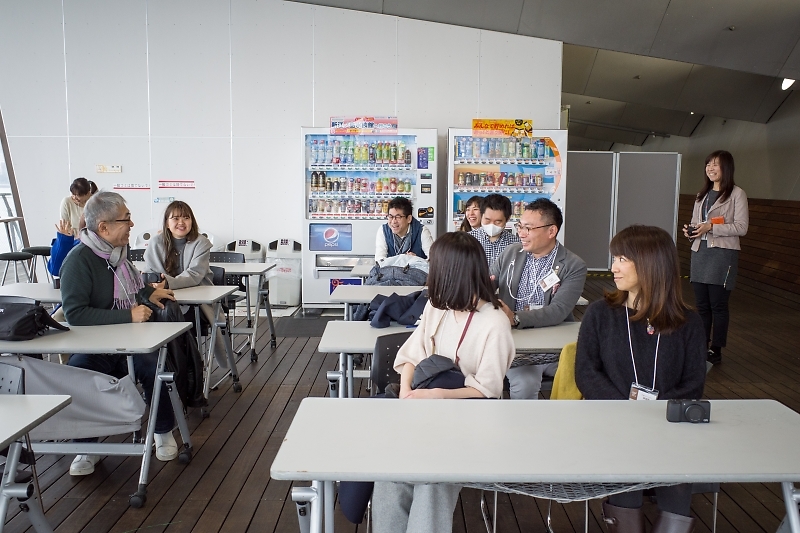 I was nervous about the public review, but we were “participants”- instead of instructors or staff- and simply enjoyed taking pictures, which we had not done for so long. Unfortunately it was rainy, but we took many pictures with the rain. 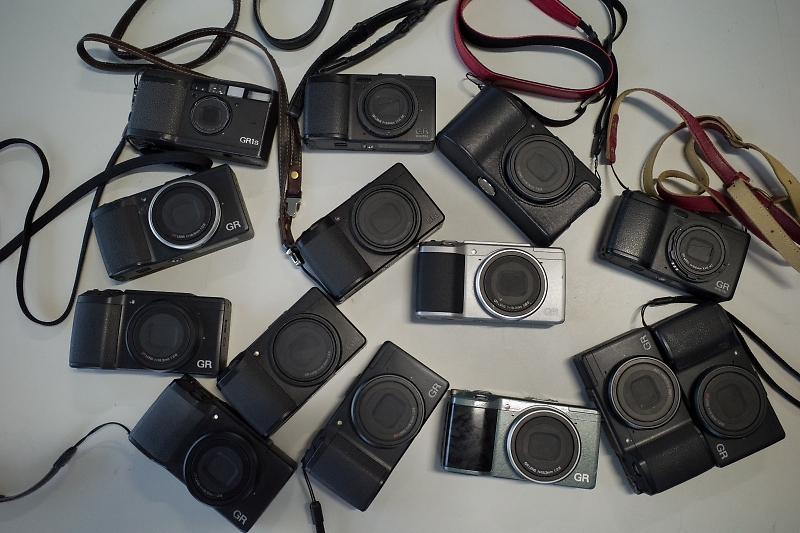 It reminded us that it is a charm of GR that you can photograph with one hand! We learned a lot from Mr. Yokogi and we experienced something that can be applied to our future projects. Thank you very much. You can apply for "GR trip" anytime! Why not take pictures with a guest GRist in your favorite place?